Upgraded design released in Nov 2017. The new design is smaller, lighter, has greater operating efficency, has over-current protection, and eliminates problems with buzzing and overheating. 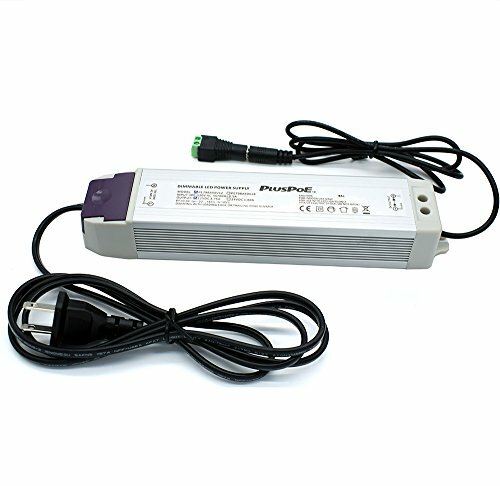 This is an excellent quality 4.15A 50W Triac dimmable power supply. Compatible with most AC wall dimmer including Lutron, Leviton and most other household dimmers. Can be used for many LED lights and other applications. Requires no minimum load and it is very quite without any buzz or humming noise. Warning: Do not overload. Overload will cause the AC adapter to fail. We are not responsible for misuse of power supply. It is recommended not to exceed the AC power supply's capacity. Please calculate your load before connecting the power. NON-waterproof use for indoor dry location only. Converts 110V AC to 12V DC while remaining compatible with standard TRIAC wall dimmers (including Lutron, Leviton, and most other standard household wall dimmers). Compatible with forward and reverse phase dimmers. Easy to install, mount, and wire. Included AC and DC cords can be removed for use in hard wire installations. Comes with 4.5 foot AC cord and 3.5 foot DC cord (both are detachable). DC cord has 5.5x2.1mm DC connector for use with most LED strip lights.